Dinosaur obsessed children aged six and over can have their observation skills tested with this novel, dinosaur jigsaw puzzle. As well as putting together the colourful puzzle, young palaeontologists then have to spot the differences in their puzzle when compared to the puzzle picture on the box. The puzzle is exactly the same as the picture, except there are twelve subtle differences. Complete the jigsaw and then try to find the differences. This one hundred piece jigsaw has been well made, the individual puzzle pieces measure approximately three centimetres in diameter, making them easy to handle for you young children. The lugs on each piece are robust and the pieces fit together well, helpful when you have to spot small differences in the puzzle that the child has put together when compared to the picture displayed on the front of the box. Jigsaws can help children develop hand-eye co-ordination as well as motor skills. The puzzle pieces are very tactile and the colourful, cartoon style picture with its twelve differences to spot aids in a child’s development of their observation skills. The theme of the jigsaw is a visit to an imaginary dinosaur theme park, a sort of cartoon dinosaur land. Eleven dinosaurs are featured, there is even a blue and yellow Dimetrodon (a Pelycosaur) lurking in the background. This colourful puzzle also features a number of flying reptiles. One thing to note is that there is a Pterosaur nest hidden in the picture, can your child spot it? All the popular and best known dinosaurs feature somewhere on the puzzle. 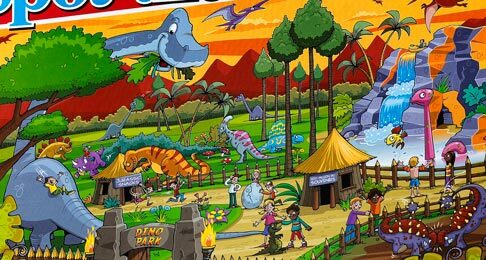 There is Stegosaurus, Brachiosaurus, Triceratops and the duck-billed dinosaur Parasaurolophus with its huge head crest amongst the herbivores in the dinosaur theme park. There are even two armour plated Ankylosaurus battling with each other in one corner of the jigsaw. As for the meat-eaters, there is of course, the obligatory Tyrannosaurus rex and by the looks of things this large, Late Cretaceous predator is about to make a meal of some of the visitors to the Park’s restaurant. There is certainly a lot going on in the completed puzzle, it took a six year old more than thirty minutes to complete the jigsaw and then another fifteen minutes or so to find all the differences. It was pleasing to note that the young girl thoroughly enjoyed making her dinosaur theme park and as each dinosaur was completed she insisted on telling us a little bit about it. The answers to the spot the difference part of the puzzle are contained on an answer sheet provided in the jigsaw puzzle box. This is very helpful, although we would recommend that the answer sheet be folded up to prevent the child seeing the answers prematurely. This puzzle with its spot the difference element, being themed around the story of a dinosaur park we think would be especially popular with young boys who have a fascination with dinosaurs. The puzzle is robust, colourful and we loved the additional element of finding the differences between our puzzle and the one featured on the box.